David Johnson sent me a pointer to a Java-based open source blogger named "Roller". David writes about it in an ONJava article titled, "Building an Open Source J2EE Weblogger". It uses MySQL (changing from Castor and HSQL) and many of the Jakarta tools. IBM developerWorks just published an article titled, "Java liberation: An interview with Jason Hunter: The story behind Apache's quest to open up the Java platform". Bob McMillan, Editor of Linux Magazine, digs to the heart of the story. Microsoft put a stop to their Hailstorm initiative today, reports The Register and other trade rags. I'm not surprised. I participated in some of the early Liberty Alliance planning meetings, and in those meetings there was strong sentiment among banks, credit card companies, and the other players that Microsoft couldn't be allowed to be a middle man between them and their customers. Microsoft got greedy. That's what did Hailstorm in. Looks like the next go-round will have Microsoft as a software supplier rather than services supplier. Elliotte Rusty Harold asked on jdom-interest today about the "Genesis of JDOM", for his book "Processing XML with Java", and I wrote a little history paper. JDOM users may find it interesting. According to some, the Apache-Sun agreement caused the biggest buzz at JavaOne this year. 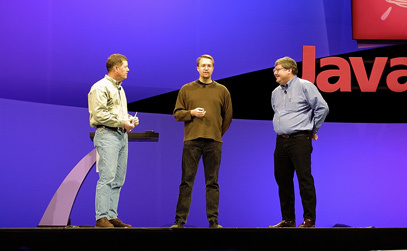 Tuesday morning started the buzz when I spoke in the Keynote with Sun CEO Scott McNealy and Sun VP Rob Gingell to announce our success in coming to an agreement over open source Java implementations. I'm frankly surprised they wanted a non-Sun person to make this announcement live on stage. I'm honored and proud I was able to be the one to make it. The speech wasn't even scripted. They said I had four minutes to say whatever I thought appropriate. I think I took eight. :-) Pictures and video are available. The buzz continued on Tuesday with Apache sending out a press release detailing the agreement. You should read it if you want background details. By the end of the week the news had been picked up by The Register, Infoworld, eWeek, InternetNews, and more. This week the buzz has subsided, the conference goers are back at work, and Apache and Sun will be back at work making the letter of intent into a reality. The events at JavaOne greatly surpassed my expectations. I'm increasingly optimistic for the future.